Epic! A movie that should not work – actually works. 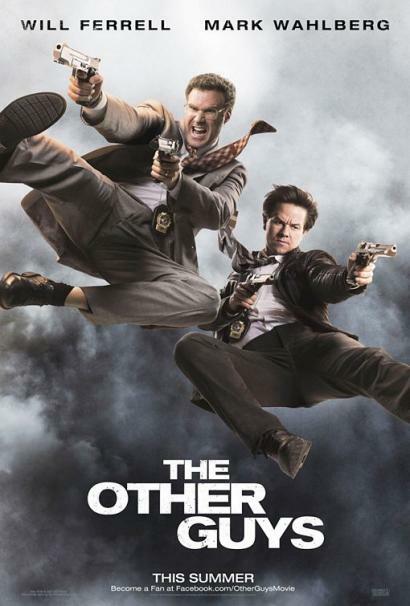 The Other Guys is a movie full of fast action sequences and even faster humor. It has more funny one-liners than Jimmy Carr’s stand-up and more high-speed chases than The French Connection. Mark Wahlberg and Will Ferrell are two mismatched NY police officers – Terry Hoitz and Allen Gamble. One is a peacock, who just wants to fly and the other is a paperwork loving ex-pimp. Their big chance to serve and protect to max comes when the two badass supercops P.K.Highsmith (Samuel L. Jackson) and Christopher Danson (Dwayne Johnson) run out of luck. Samuel L. Jackson and Dwayne “The Rock” Johnson do a brilliant job as the over-the-top-rock-star-cops. Their entrance is only topped by their exit! So urgent is Terry Hoitz’s need to prove himself that he kidnaps his partner to force him to go to a crime scene. It does not go according to the plan and they end up with a cocaine-covered car. On the way back it’s Allen Gamble’s time to kidnap Hoitz – with his wooden gun. They start investing Gamble’s huge case about illegal scaffolding permitting, which leads them to discover a financial conspiracy masterminded by a British banker David Ershon (Steve Coogan). At the end of the first meeting with Ershon, Hoitz and Gamble have lost their shoes and made some serious enemies. There are fantastically funny scenes in this movie like the very quiet fight scene in a funeral and Gamble’s first desk-pop. The chemistry between Mark Wahlberg and Will Ferrel is perfect! I don’t think anybody else could pull off the always-yelling-trying-to-prove-himself Terry Hoitz better than Mark Wahlberg. Special mention to Michael Keaton’s TLC (don’t go chasing Waterfalls) quoting captain Gene Mauch, who has a second job at Bed, Bath and Beyond. Everything in this movie is over the top – the silliness, the stunts, even the stupidity of the bribes. There is a lot of banter between the two main characters; sometimes going into lengthy debates – like the one about lions v tuna. Even then the dialogue does not lose any speed. At the end of the movie the mystery remains about why and how did the bad-guys take Hoitz’s and Gamble’s shoes? And why are all the hot women attracted to Gamble? These are never explained. But tell you the truth, they don’t need to be explained. The funniness lies in the mystery. If you want to be thoroughly entertained and laugh so that it hurts – this is a movie for you! At the crime scene.lol. Good tweet!